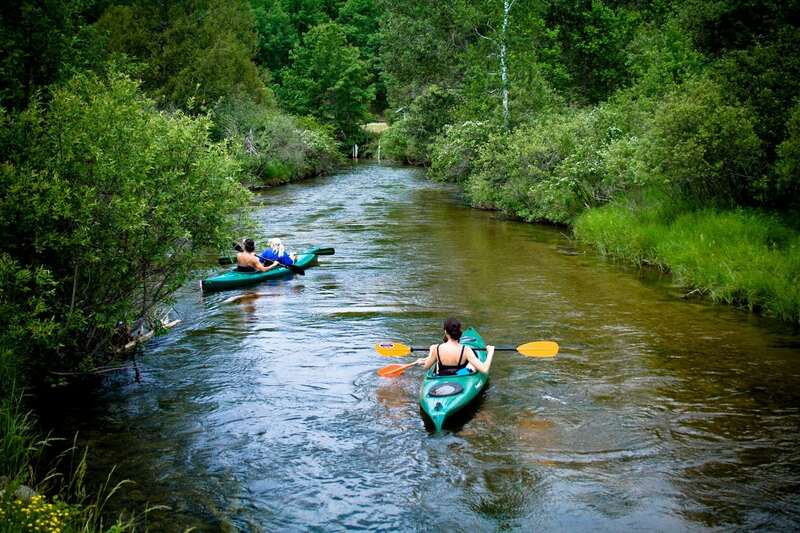 Unwind on the water, get your toes sandy, and make memories that will last forever at these resorts in Nothern Michigan. It may be hard to believe, but summer is not that far off. And whether you’re looking for your own Up North getaway or you want to recommend a cozy spot to friends, there are plenty of options. Here, we take a look at some of the best Northern Michigan resorts. Many are on inland lakes, others near rivers or streams, and one is surrounded by big water. All are unforgettably charming. Located on Crystal Lake between Beulah and Frankfort, Chimney Corners offers summer cottage rentals, either on the beach or on the bluff. Expansive windows off the private decks and patios provide the beachside views, while the 300 acres of forested woodlands beckon the intrepid hiker. The resort opened in 1935, the vision of a former lumberman who was out of work in the midst of the Great Depression. Desperate to generate income for their young family, Olin and Leola Rogers turned their vacation home into a guesthouse for boarders. This third-generation family resort offers the sparkling waters of Crystal Lake, beachside bonfires, tennis, and basketball on the resort’s courts, and new this year, nightly meals at the beachside dining room. Located on a bluff overlooking Herendeene Lake, Sleeping Bear Resort is just outside Lake Ann, halfway between Sleeping Bear Dunes National Lakeshore and Traverse City. 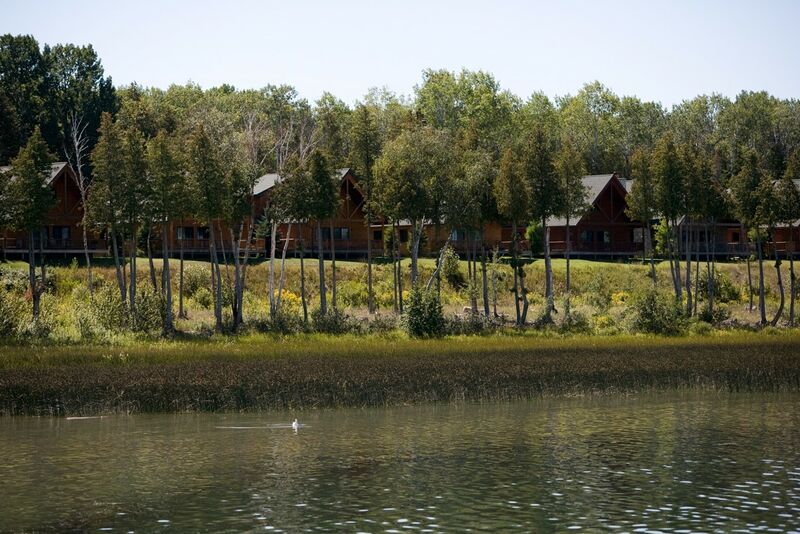 The resort’s lakefront lodging options consist of six cabins, a five-bedroom log home, and the six-bedroom “Bear’s Den” farm home. The property extends 450 feet along the eastern shore of the lake and includes a private beach with plenty of water toys including kayaks, fishing boats, and a water bouncer. There are plenty of places to relax—lounge by the fire or on two decks overlooking the water. Wait, is that a shuffleboard court? Yes. Yes, it is. This 195-acre resort on the Boardman River dates back to the early 1900s. The main lodge and dining room boast a Western theme, with vaulted ceilings and a huge circular fireplace. The theme is reinforced by the 35 horses on the property. But you needn’t be a horse lover to enjoy Ranch Rudolf. There is a motel, campground, and bunkhouse, as well as a restaurant, swimming pool, archery, volleyball—even a canoe and kayak livery. It doesn’t slow down in winter. Sleigh rides and nearby snowmobile trails keep guests active. So it’s not really on the river. Why the name? As one of the early campgrounds in the lower Betsie River Valley, it was so named long ago. And it is on the Betsie Valley Trail in the midst of the Betsie River State Game Area. It’s not far by bike or car to the river. 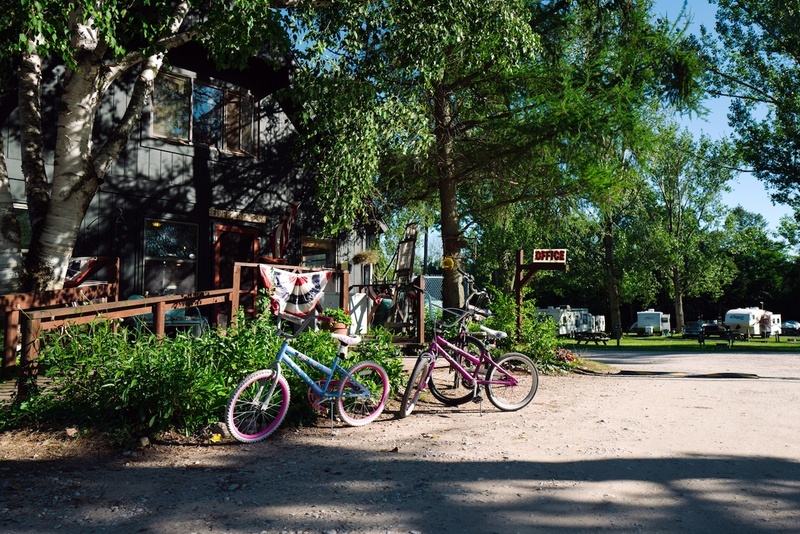 Most sites at this campground have room for four people, a camper or tent, a boat, even a dog or two. It boasts a tiny cafe, small playground, fish station, warm showers, and bike and kayak rentals. You can even hop on the aforementioned Betsie Valley Trail for a three-mile adventure to ice cream, beaches, shops, and more. Not to mention nearby fishing, beaches, breweries, and wineries. Oh, and did we mention beaches? The seven modern one-room cabins and five cottages are outfitted with rustic log furniture, satellite TV, wifi, even a refrigerator, coffee maker, and microwave. Located on M-115, it’s almost next door to Crystal Mountain Resort (golf, skiing, biking shops, dining). Yet it’s also just minutes away from lakes and rivers perfect for fishing and canoeing. Take to the woods for hiking or hunting, or go for a short drive to wineries, Crystal Lake, or Frankfort’s beaches, shopping, brewpub, and theater. Okay, it’s not quite Mom ’n’ Pop-esque—not with two restaurants, a championship golf course and, ahem, a bowling alley. But c’mon, it’s on an island! And it still boasts that rustic vibe with log décor and accents in corrugated steel. This sprawling resort encompasses more than 1,700 acres. It is located off the eastern tip of the Upper Peninsula on Drummond Island, a.k.a. the Gem of the Huron. The pool is off one leg of the log-themed lodge, with a restaurant and Pins bowling alley off the other. Above the lobby is a huge lounge area with a large fieldstone fireplace. It boasts a large beachfront with kayaks and pontoons available, tennis courts, freestanding cabins, and did we mention the bowling alley? If you’re looking at the Gem of the Huron but want something that is really more mom and popsy, this may be the place. It’s got one-, two-, and three-bedroom cabins. Family-friendly amenities like a playground, fire pits, barbecue grills, picnic tables, and horseshoes beckon vacationers. Live to fish? 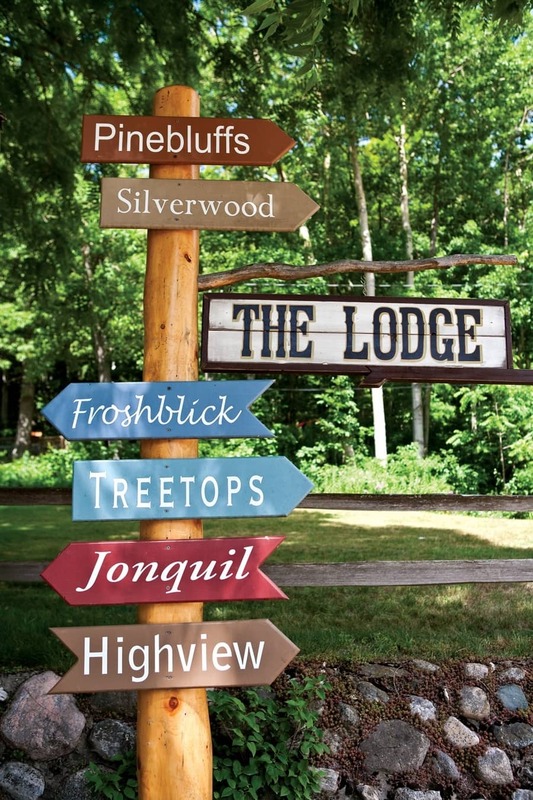 Birch Tree Resort is the place for you. It offers a fish-cleaning house with electric and water, a protected harbor, even a bait shop. And plenty of fish in the waters of Lake Huron. Visit its website and you’ll see the words “Unplug. Unwind. Step back in time.” The four cottages invite you to slow down and enjoy life. And while it’s the perfect place to relax—it offers boating, swimming, fishing—it’s not like you’re stranded. You’re within walking distance to Lake Leelanau’s charming downtown, with a grocery store, restaurants, playgrounds, shops, and more. Located in the middle of Leelanau County, you’re no more than five miles from the big water, as well as wineries, the casino, and more activities than you can imagine. A short drive to Traverse City, yet relaxing in its quietude. Billed as Michigan’s oldest continually operating historic hotel, Old Mission Inn was built in 1869. With its genteel atmosphere, antiques, and quiet atmosphere, you’ll feel like you’ve stepped back in time. But with today’s amenities—cable with a flat-screen TV, whirlpool bath, and wifi. Come evening you can relax in a rocking chair on the 135-foot veranda, sipping a glass of wine from one of the nearby wineries. Or maybe you’d rather lounge in an oversize hammock with a great summertime read and watch the sailboats on East Bay. Made to order breakfasts—it is a B&B, after all—are served in one of the two dining rooms until 10 a.m.